How this Blues Lyrics and Hoodoo archive supports "Hoodoo in Theory and Practice"
This web site helps fans and performers of African American blues understand what the lyrics to the songs are about. Blues fans who listen closely to song lyrics often wonder what a "mojo" is or why one would carry a "John da Conqueroo." Most people know these terms have something to do with African American folk magic, and they may even have run across interviews or songs in which a musician uses the word "hoodoo," but many incorrectly assume that the terms come from the Haitian religion known as Voodoo or Vodoun. By reading "Blues Lyrics and Hoodoo," fans and performers will the true roots of these lyrics. 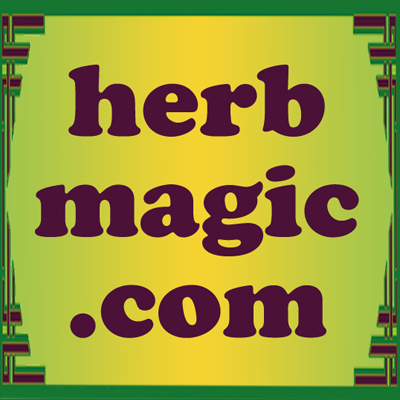 This site also helps practitioners of African American folk magic, hoodoo, rootwork, and conjure, as well as academic students of folklore, ethnography, ethnomusicology, and ethnomagicology. By using the terminology found in songs, it proves that African American hoodoo is an independent form of folk magic in its own right, and not modified form of European American folk magic, and it demonstrates historically documented beliefs and practices concerning luck and magic, divination and fortune-telling, spell-casting, and the removal of spells. My online book about 20th century African-American folk-magic, Hoodoo in Theory and Practice, will conveniently answer most questions that blues fans have about these lyrics, but i have created this sub-site on "Blues Lyrics and Hoodoo" because in gathering information on hoodoo, i have found that some of the clearest descriptions of magical materials and their methods of employment can be found in acoustic blues of the period between the two World Wars. In other words, blues lyrics themselves form a primary source of oral history and shed light on little known by-ways in folk custom. From the blues we can learn or receive independent confirmation about such things as how Goofer Dust was used in Memphis in the 1920s or the mechanisms of dream divination systems employed to obtain lucky numbers for lottery gambling. Thus these pages not only serve to "explain" obscure lyrics to fans, they use the blues to demonstrate rural folk-magic to contemporary practitioners. I use blues lyrics to exemplify specific magical concepts in "Hoodoo in Theory and Practice" because the 1920s - 30s was a period during which mainstream folklorists, scholars, and book publishers paid scant attention to cultural contributions by African-Americans. Hoodoo, a beautifully coherent system of practical folk magic, was for the most part dismissed as "superstition" and went unrecorded by scholars or occultists. But these same two decades coincidentally marked the time of the greatest development of recorded rural acoustic blues, and hoodoo was a prominent topic addressed in the lyrics to these songs,. Thus, blues lyrics of the 1920s - 30s often provide our best glimpse of how hoodoo was practiced in the decade preceeding Harry M. Hyatt's compilation of oral histories from root workers from 1936 - 1940. "Hoodoo in Theory and Practice" pages that include primary lyrics as documentation. Here is a convenient quick-list of Lucky Mojo Pages that quote or allude to blues songs. Will Shade and the Memphis Jug Band: "Aunt Caroline Dyer Blues"
Furry Lewis: "Black Gypsy Blues"
Merline Johnson: "Black Gypsy Blues"
Robert Johnson: "Stones in my Passway"
Robert Johnson: "Little Queen of Spades"
Cripple Clarence Lofton: "I Don't Know"
Ma Rainey: "Black Dust Blues"
Arthur "Big Boy" Crudup: "Hoodoo Lady Blues"
Robert Johnson: "Hell Hound On My Trail"
Willie Dixon (as sung by Muddy Waters): " My John the Conqueror Root"
J. T. "Funny Papa" Smith: "Seven Sisters Blues"
Willie Dixon: "The Seventh Son"
Willie Dixon: "Hootchie Cootchie Man"
Blind Willie McTell: "Scary Day Blues"
Coot Grant and Kid Sox Wesley Wilson: "Keep Your Hand Off Of My Mojo"
Preston Foster (as sung by Muddy Waters): "I Got My Mojo Workin'"
Blind Willie McTell: "Drive Away Blues"
This includes both primary and secondary songs. Lenoir, J. B.: The Mojo, a.k.a. Mojo Boogie, Voodoo Boogie (jack ball) 1953, etc. I offer Rewards, Prizes and Credits to blues fans and scholars who help the project. songs that i can transcribe, if that is easier for them. the songs. In other words: no Jimi Hendrix, John Mayall, Dr.
John, Eric Clapton, or Aerosmith. of an older song with a different title. these pages, please contact me through the Lucky Mojo Forum. This is an incomplete list at best, but please check it out if you want to help. Songs for which i have titles and performers, but no lyrics or incomplete lyrics. 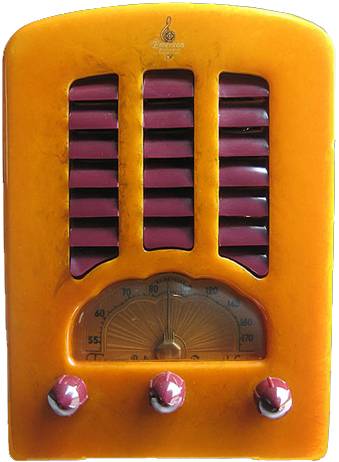 Based on material developed for her famous Blues Lyrics and Hoodoo web site, Cat Yronwode's Hoodoo Jukebox is a set of 26 songs by African American musicians of the early 20th century that mention and describe the many facets of hoodoo. These authentic acoustic blues sources provide insights into candle magic, hot footing, mojo hands, black cat bone spells, spiritual shop culture, jinxing, the role of professional readers and root workers in hoodoo, and how to divine from omens and signs. Performers include Arnold Wiley, Jim Towel, Sara Martin, Leola "Coot" Grant and "Kid" Wesley Wilson, Blind Willie McTell, Clifford Gibson, Margaret Whitmire, J. T. "Funny Papa" Smith, Bill "Jazz" Gillum, Johnnie Temple, Waymon "Sloppy" Henry, the Memphis Jug Band, and more. 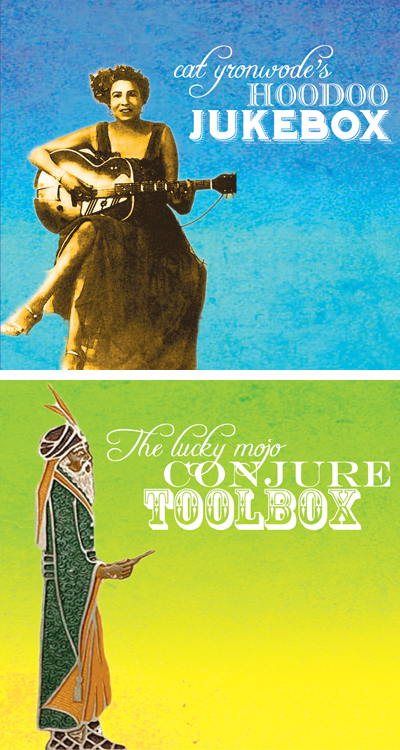 The Lucky Mojo Conjure Toolbox will provide you with an amazing arsenal of 89 digital images to incorporate into your personal magical spell-work. These images are sized just right to be printed out as candle labels, carried as talismans, personalized as petition-papers, or adapted for use in the construction of multi-media hypersigils. Enhance them with photo-editing software -- or collage them on the fly with simple scissors-and-glue techniques. Your capacity for innovation is limited only by your imagination! Custom Conjure Art compiled, designed, and edited by Dr. E., Deacon Millett,nagasiva yronwode, Professor Ames, Kast Excelsior, and catherine yronwode. This will allow you to make any kind of keyword search including text lyrics. 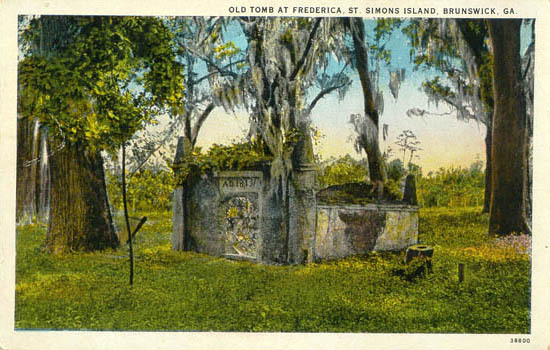 You can use GOOGLE.COM to SEARCH THIS SITE for a song title (like Ticket Agent Blues or Jim Tampa Blues), for the name of a performer (like Texas Alexander or Charley Patton), or for lyrics containing a keyword (like hoodoo or mojo or coffee). Because this site contains so many pages on a variety of non-blues topics, if you only want blues lyrics, you might want to add some limiting keywords to your search, words that will only turn up in the blues lyrics pages. I suggest the words "transcription" and "matrix."